A rules supplement for the budding brewer. A review copy of “Magic Potions & Ingredients” was provided for the purposes of this review. Magic potions are a mainstay of Dungeons & Dragons, yet both the Player’s Handbook and Dungeon Master’s Guide are woefully bereft when it comes to alchemy and brewing. RPG Papercrafts’ “Magic Potions & Ingredients” supplement fills in that gap nicely, featuring 30 new, detailed, craftable potions and brewing rules to satisfy any alchemist. The supplement is written as an in-game guidebook that your PCs would read, as oppose to the players themselves. It makes “Magic Potions & Ingredients” a much more enjoyable and personable read, particularly the hilarious flavor text and descriptive notes on each individual potion. It also comes with several pages of printable, cut-outs for each potion entry for your players, which I would highly recommend. 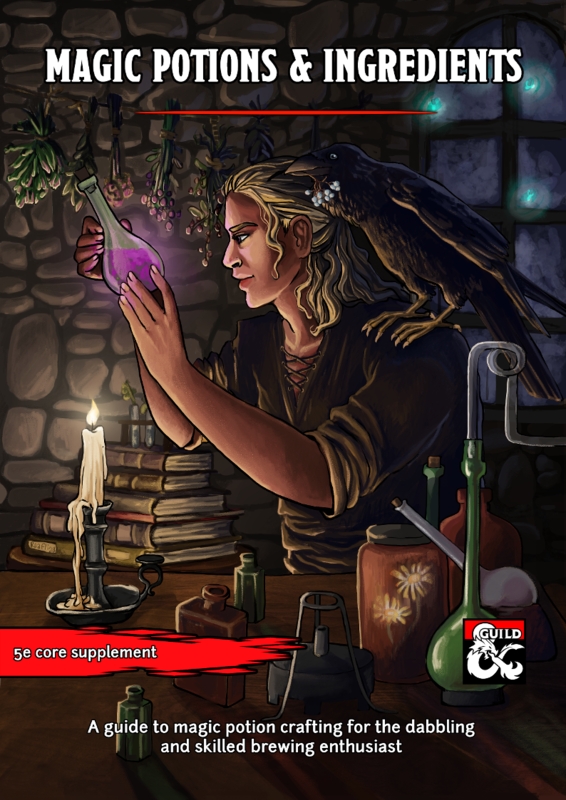 The first few pages explain the new rules governing potion brewing, wisely suggesting that these rules be introduced slowly and recipes learned gradually so as not to overwhelm your players. Potions and ingredients are given a range of rarity and price. Very rare potions have a range of 1,000-5000 gp! That seems bonkers, though higher level PC do tend to swim in cash. Crafting potions requires Nature, Survival, Arcana, or Religion checks. A brewer could attempt any one of those without being proficient, but it incurs Disadvantage. The DC is listed for each individual potion. Rolling a natural 1 (or failing with disadvantage) results in a Foul Potion, featuring a d100 table of Negative Effects. It’s inspired by the Wild Magic table, ranging from funny but innocuous effects all the way to summoning a demon! 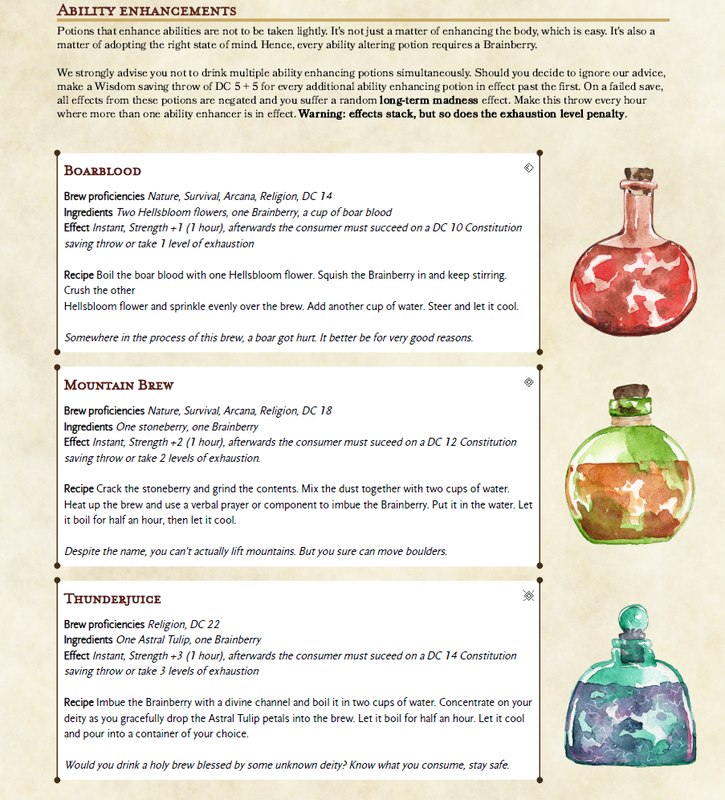 The majority of the 20-page supplement is dedicated to providing detailed descriptions of the 30 new potions, as well as their unique ingredients. Every single entry includes unique artwork, potion effects, ingredient listing, and brewing instructions. The attention to detail is fantastic. It reads like a fun fantasy cookbook and the pictures are a really nice touch. It’s impossible to tell the balance level of each potion at a glance, but there was definitely some attention given. All of the stat-enhancing potions, for example, include a CON saving throw to resist gaining levels of exhaustion after the effects wear off. Possibly suffering three levels of exhaustion from gaining +3 STR for an hour feels brutal, not to mention the DC 22 check required to craft the awesomely named Thunderjuice potion. On the one hand you want to be able to motivate players to create cool potions, while at the same time not make them too accessible or powerful, or make your non-potion brewing PCs too weak by comparison. A tricky line to walk. The guide ends by providing detailed descriptions of the 21 new custom ingredients. I was particularly impressed that these ingredients are given the same effective layout and artwork as the potions, including descriptions, locations, and which parts are harvested. “Magic Potions & Ingredients” is a lovely read, even if you have only a passing interest in brewing. Reading through it makes me want to add potion crafting into all my future D&D campaigns, and that’s always a ringing endorsement to any supplemental rules guide. Provides intuitive rules and tables for crafting healing, poison, stat-enhancing and other magic potions. Professional design and layout, with lovely artwork for all 30 potions and 21 ingredients. The Negative Effects Table is a lot of fun. Hallucinate shadow creatures! Blink in and out of existence! Summon a demon! Why only STR and DEX for stat-enhancing potions? The Verdict: “MAgic Potions & Ingredients” provides everything you and your players need to add potion crafting and alchemical fun into your campaign.